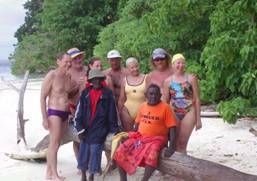 Dive Gizo - Newsletter and What's News!
. Jen, Graeme, Brian, Sunga, Geoff, Solomon and Ahi look forward to meeting you on your next visit. Kerrie and our PADI Instructor Fabien Astre attended the 2015 OZTek Dive and Travel show which was a great success this year.The show had a 10% increase in visitors and participants to the various lectures. In April, the film crew from the Travel Bug toured the Solomon Islands and enjoyed some diving with us. The program should air later in the year. Following the 2007 earthquake, we are very pleased to say that fish life is as prolific as ever and the 2 damages dives sites on West Ghizo, now have plenty of regrowth of many varieties of coral. Most sites had little damage as you go east from Ghizo Island, which means the quality of diving continues it's high standard. Divers today see less evidence of the events 6 years ago due to health of the reef system. rPlease feel free to contact us directly for updates. Nemo, our shop security was seen relaxing on a day off with his sister Brownie at the beach recently. Be assured though, that he is diligent in his job at night in the dive shop! The ANZ and BSP banks are providing 24 hr service to customers and visitors requiring access to cash from their overseas accounts via their ATMs. Dive Gizo continues to accept VISA / Mastercard for all services through the dive shop and now have added American Express. Dive Gizo continues to be involved in a joint oceanograhic project with SCRIPPS and NOAA deploying and recovering Spray Glider units due south of Ghizo Island. The latest recovery was March 2015 and deployment was June. In the mean time, look who else is checking out the gliders! .Jeff Sherman and Danny during the deployment of Mission 006 on 5 July and recovery of mission 005 on July 19 showing growth from 5 months in the sea. New Discovery after April 2 2007! In the early morning hours of August 2nd 1943, the patrol boat PT109 was sunk after being rammed by the Japanese destroyer “Amagiri” in Blackett Strait, Solomon Islands. The Captain, Lt. John F. Kennedy, an ex Harvard swimmer spent the next 30 hours supporting and towing his 10 surviving crew members to a temporary shelter known today as Kennedy Island. In addition to the swim after the collision, Kennedy stage a daring rescue attempt, swimming first to Naru Island and then to Olasana Island in search of help and a better food source for his men. His swim of approximately 8 kilometres, through waters patrolled by enemy ships, has long been recognised as a feat of tremendous courage and bravery. Another historic occasion occurred on the 4th August 2003. A marathon swim marking the 60th anniversary of the sinking of PT109 , and the first of what will become an annual event – The PT109 Swim Marathon in Gizo. 2003 saw 8 participant from Australia, New Zealand, United States and the Solomon Islands. The winner, Suanne Hunt of Australia, completed the swim in 2 hours, 10 minutes and 35 seconds. Second place getter, Paul Ellercamp – a veteran of ocean swims, described the PT109 swim as “the hardest swim I have ever done”. 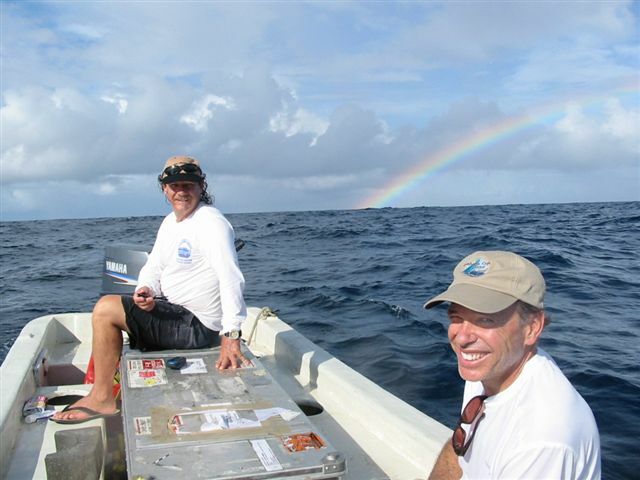 A number of years back, Dive Gizo received a visit from Dirk Cussler, son of world famous author, Clive Cussler. Dirk was researching a new book for his father, a sequel to the popular ‘The Sea Hunters’. Dirk and co-author, Craig Dirgo came to Gizo to find the elusive PT-109, the WWII patrol boat captained by future US president John F. Kennedy. Although the Sea Hunters didn’t find PT-109, it was great fun and really interesting being involved in the research. Dive Gizo continues to joined forces with the World Wide Fund for Nature to protect the amazing reefs in the area. 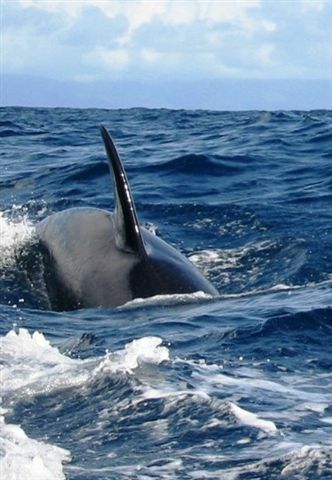 Permanent moorings have been provided at 24 of the dive sites and fish monitoring sites around the area. Dive Gizo and WWF have actively sought funding from various aid and environment programs and used local workers and materials to produce the heavy duty moorings. 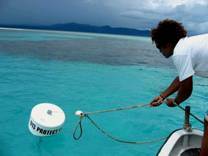 These moorings are available for use by anyone and will prevent anchor damage to the coral. Dive Gizo thanks WWF for their help with this project and is proud that groups in the Solomon Islands are so active in protecting their spectacular marine environment.